Ideal for fake wounds, warts and noses, this moulding wax is completely water soluble. Soften a small ball of wax and apply to the area where you are creating your special fx. Using water, spread the edges to blend into your skin. 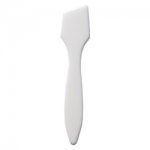 Then with a spatula shape as required. Then apply fake blood as necessary. Click here for tutorial on how to create a cut finger effect. PEG-8 Stearate, Glyceryl stearate, PEG-75 lanolin, Ricinus communis (Castor oil), Phenoxyethanol, Methylparaben, Ethylparaben, Propylparaben Butylparaben. All cosmetics can, on rare occasions cause allergic reactions and the product should not be applied near the eyes nor to sensitive or broken skin. Do no leave on overnight. 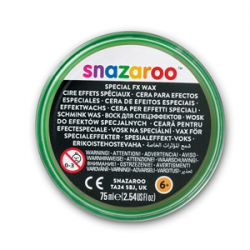 Click here for a Material Safety Data Sheet for Snazaroo Special FX Wax.